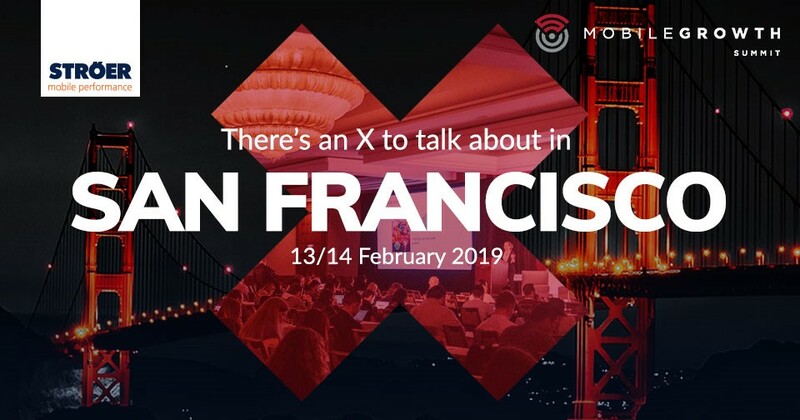 On 13 and 14 February 2019, San Francisco plays host to Mobile Growth Summit, the world’s largest mobile growth conference. Our team will be in California to present our app marketing solutions and bring an X to talk about. What is that all about? You’ll find out when you talk to us in San Francisco. We’ll send Timo Richardson, our co-CEO, and our Head of Sales, David McTaminey. “Heading to San Francisco offers us a great opportunity to connect with many of our existing, Silicon Valley-based partners and combine this with a visit to one of the industry’s premier networking events specializing on our key activity: growth”, says David McTaminey. We’re also in Berlin for White Nights Conference in February. Find out more and book your meeting here! Mobile Growth Summit is a non-vendor event, so it really focuses on learning and networking. It’s made for professionals specializing in the areas of user acquisition, monetization, retention/engagement, re-engagement and data science. Looking at the event’s schedule, we’re looking forward to hear Christian Calderon, CEO of GAMEJAM. He speaks about Hypercasual Gaming. It will be interesting to hear what Ngozi Ogbonna, Co-Chair Global Panels – mBolden, Melissa Lertsmitivanta from Realtor.com, Chang Chen from Otter and Vanessa Chang from Earnin have to say about “Targeting & Re-Targeting Outside of Facebook”. And let’s see how Eric Seufert from N3TWORK sums up the “State of the App Economy”. Be quick to arrange meetings with us! Simply click on this link to arrange your meeting with Timo Richardson, our Co-CEO, or David McTaminey, our Head of Sales. And make sure you mention the letter X to find out more of what’s to grow here soon!